Kess V2 V5.017 KESS 2.47 Ksuite Software VS. KESS V4.036? What Differences Between KESS V5.017 and KESS V4.036? Kess v2 2.47 K suite software with Kess 5.017 firmware EU clone red PCB board support more EPC model than Kess 4.036 firmware. So what’s the different between KESS v2 5.017 and KESS V4.036? Below eobdtool.com compare Kess v2 2.47 firmware 5.017 with Kess v2 4.036 as following. Kess v2 2.47 firmware 5.017 compare with Kess v2 4.036? And V4 support cars only untill 2014, but V5 supports vehicle accroding to Engine. Kess V5.017 works well for EDC17/k-line/DSG/DQ200 DQ250 DQ500 Gearbox/ST10…. ! 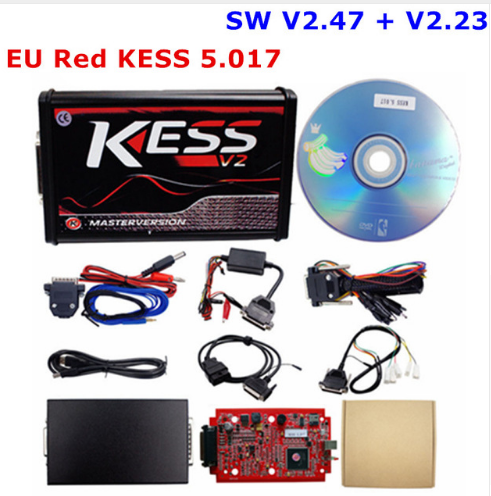 Need Kess v2 5.017 firmware work with 2.47 K suite software Kess v2 Master ECU Chip Tuning Kit just contact us freely. « Kess v2 K suite 2.47 Software 5.017 Firmware Compatible with Kess v2 2.23?